When photographing a solar eclipse, there are a few very important considerations you have to keep in mind to avoid damage to your camera equipment or to your eyes. 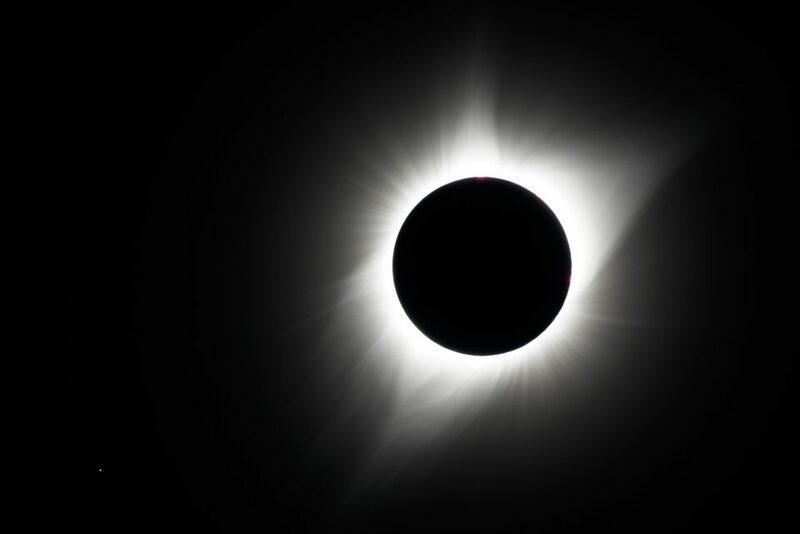 In this article, we will take a closer look at where you should physically be at the time of totality, what equipment you should have on hand, what safety precautions to take before, during and after the solar eclipse, and what framing and composition aspects to consider. Keep in mind that totality might only last a couple of minutes, so if you are not fully prepared, you might miss the opportunity to photograph this rare phenomenon. I have been fortunate to witness and photograph two solar eclipses before – one partial (in 2012) and one total (in 2017), both in the USA. The partial eclipse was blocked for the most part by thick clouds, but I still managed to take a few shots when the clouds cleared up a little. The total solar eclipse, on the other hand, took place on a very clear day in Wyoming, so I was able to photograph the whole event from start to finish. In this article, I will write about my experience photographing these two solar eclipses and provide some guidance and tips on how you can take advantage of your camera gear and plan the next solar eclipse event. 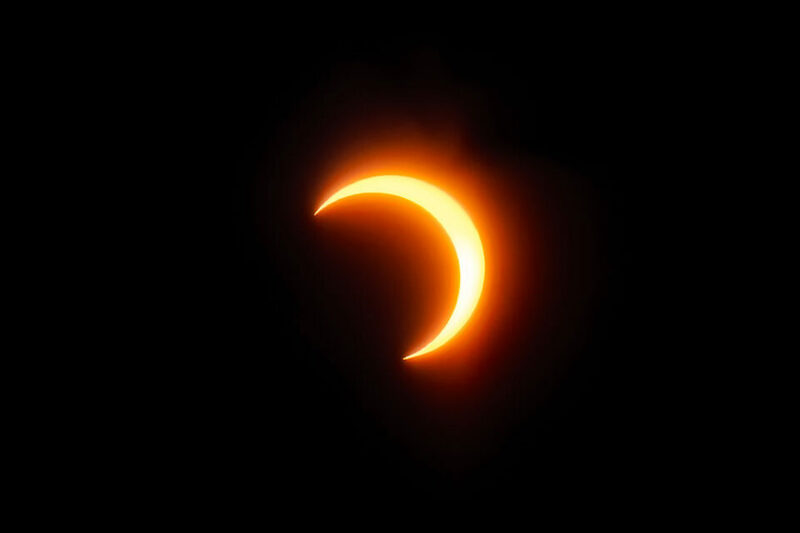 A solar eclipse is a rare cosmic event that takes place when the moon gets in between the sun and the Earth, blocking sun rays partially or fully, essentially casting a shadow over Earth. Solar eclipses can only take place when the moon is new and it is directly aligned with the sun and the Earth, and depending on the moon’s proximity to Earth and the relative alignment of the three, a solar eclipse could be partial, total or annular. Hence, a solar eclipse is a cosmic coincidence. A total solar eclipse occurs when the moon fully covers the sun. It is the rarest of the three to witness, because several things need to happen at the same time. First, the three celestial objects need to be properly aligned, so that the moon can fully block the sun and cast its shadow. Second, the moon needs to be at the right distance from the Earth – if it is too far, it will not fully cover the sun. Third, in order to see a total solar eclipse, one has to be in the direct path of alignment of the moon and the sun, or in the center of the moon’s shadow. During totality, light levels can drop to very low levels, creating an eerie feeling and sometimes even allowing one to see stars in the middle of the day. You will be seeing a “ring of fire” around the moon, or the sun’s corona, which is pretty incredible (and this is exactly what happened during the last total solar eclipse on August 21, 2017). A partial solar eclipse occurs when the sun, the moon and the earth are not exactly aligned, or the observer is located outside of the center area of the moon’s shadow. As a result, the moon does not appear to fully cover the sun. Lastly, an annular solar eclipse takes place when the moon is too far from the Earth in order to fully block the sun. As a result, one can observe a bright ring around the moon during the eclipse. You will notice that I used the same formation in the distance as my foreground for the total eclipse shot, as shown further down in this article. This highlights the importance of proper planning and scouting – I would highly recommend to arrive on location a few days in advance and do your best to find the exact spot where you will be photographing from. The only big variable is weather…make sure to check out weather forecast and have other options if your spot does not work out (provided that you can travel there fast enough). If you have never had a chance to witness a total solar eclipse, I would highly recommend to see it. The next total solar eclipse will land on the US soil in 2024, but there will be other eclipses taking place starting from as early as 2019. To see a list of upcoming solar eclipses, check out this website that shows solar eclipses for the next 10 years. There are also other resources such as NASA available, which provide accurate information on when one can expect to see solar, as well as lunar eclipses. Before I talk about the process of photographing a solar eclipse, let me first talk about the dangers of doing it. First of all, you should never look directly at the sun with your eyes, especially through an optical viewfinder, since everything will appear much more magnified when a telephoto lens is attached to your camera. Remember Galileo or those crazy people who stared at the sun and went blind? You surely do not want to end up with the same fate. Looking at the sun through a viewfinder, telescope or binoculars without blocking any light can result in immediate loss of vision – it will literally burn a hole in your retina! Keep in mind that looking through a lens is similar to using a magnifying glass or loupe…very dangerous. It is a pretty serious matter, so it is absolutely critical that you take necessary precautions. When it comes to gear, you will need to consider two types of gear: one for viewing and one for photographing a solar eclipse. If you prefer to enjoy seeing the eclipse with your eyes, then get a pair of eclipse glasses. At just 15 bucks for a pack of 5 eclipse glasses, you can equip yourself and those around you with the right type of protection. And no, regular sunglasses will not work – you need much darker filters that barely pass any light through them. If you want to step up the viewing game, you will either need a solar telescope or solar binoculars. If you already own a telescope and it allows you to add filters, you will need to get a separate solar filter. Since there are too many solar telescopes, solar binoculars and add-in solar filters to list and this article is aimed at providing detailed information on how to photograph a solar eclipse, I will not provide any specific recommendations on such gear. For photographing a solar eclipse, you will need to carefully choose what camera gear you will be taking with you. Ideally, you might want to capture two separate types of images using two different setups: a close-up of the eclipse using a super telephoto lens and a wide-angle view of the scene you will be at. Both can yield very interesting and unique images! 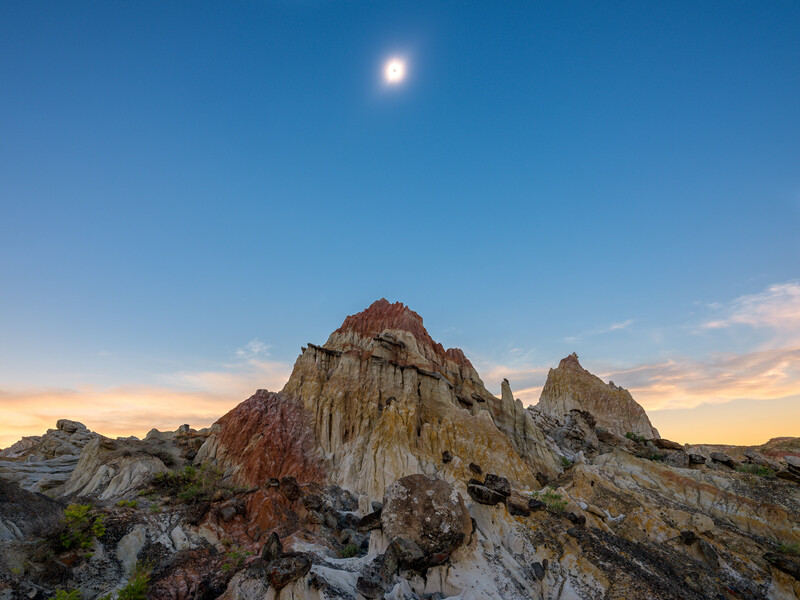 Keep in mind that it is going to get fairly dark during totality, so a wide-angle view of the scene around you might result in great-looking photographs, especially if you have something beautiful to include as part of your composition. Based on this, I will be providing two different gear and technique recommendations – one for getting a close-up of the solar eclipse, and one for those wide-angle shots. Digital Camera: Pretty much any digital camera will do, whether you are planning to shoot with a DSLR, a mirrorless camera or a point-and-shoot with an optical superzoom lens. Super Telephoto Lens: If you want to get a good close-up of the solar eclipse, you will need a super telephoto lens – the longer, the better. See additional notes below on ideal focal length. ND / Solar Filter: A dense solar ND filter is a requirement to prevent potential damage to your eyes or your camera gear. Tripod: You certainly do not want to be hand-holding a camera with a super telephoto lens attached to it, so a tripod is a must. Remote Shutter Release: Not necessary, but might be useful during totality when it gets darker and your shutter speed drops to camera-shake prone levels. As you can see, a 200mm lens on a full-frame camera is going to yield a tiny view of the eclipse – you will need to crop quite a bit to get a usable image. And if you go too extreme and shoot with a 2000mm setup, you will be faced with all kinds of challenges: from constant needs to re-adjust framing, to cutting off the sun’s corona. Ideally, you would want something in between, perhaps around 800mm to 1200mm at most. Now you might be wondering how it would be possible to achieve such crazy focal lengths – after-all, most people don’t have an 800mm f/5.6 lens to shoot with. The good news is, there are a number of great solutions and this is where crop factor comes into play. That’s right, if you use a camera with a cropped sensor, you can get to those crazy focal lengths much easier at a much lower cost. For example, Nikon 1 cameras have a 2.7x crop factor, so if you use something like the Nikon 1 NIKKOR VR 70-300mm f/4.5-5.6, you could easily get to 810mm equivalent field of view by zooming in to 300mm. And if you don’t have that particular lens for Nikon 1, you could slap on a cheap 70-300mm VR lens with the Nikon FT1 adapter and get to the same focal length. If you own a Nikon 300mm f/4 lens, you could pair it with a 1.4x teleconverter and easily get to 1134mm with a Nikon 1 camera, which is pretty incredible! That’s not bad for a small and fairly inexpensive camera! If you don’t have a Nikon 1 setup, why not get something like the Nikon Coolpix P900? At $600, it is a cool little setup to get to 2000mm. Don’t believe me? Check out our in-depth review of the Nikon Coolpix P900. Things get a bit tougher with APS-C cameras, since you will still need something like a Tamron 150-600mm to get to 900mm equivalent FoV. And if you are planning to use a full-frame camera, you’d better shoot with a high-resolution DSLR like the Nikon D810, since you will most likely be cropping quite a bit. For these reasons, I think an ideal super telephoto setup would be a Nikon 1 camera with native or adapted lenses, or a superzoom point-and-shoot like the Nikon Coolpix P900. These will easily get you the reach you will need to magnify the solar eclipse as much as possible. For the above shot, the Nikon 1 J5 was mounted on the Sky-Watcher Star Adventurer (setup by my friend Tunc Yildirim), which did a phenomenal job with tracking the eclipse, so that we did not have to worry about constantly adjusting a tripod head. Speaking of which, you certainly do not want to be dealing with a ballhead when photographing the solar eclipse! I quickly found this out the hard way – trying to constantly re-adjust a ballhead when shooting with a super telephoto lens was a nightmare…and I had a very solid head with me. Ideally, you should have an astro tracker as the one I pointed out earlier, but if you do not have one, then you should use a geared head or a balanced gimbal instead! For the second camera to capture those wide-angle shots, you don’t need anything special – any camera + wide-angle lens combination will do. Just make sure you have another tripod or surface where you can rest this camera. To make sure that you don’t go back and forth between cameras during totality, I would set up this secondary camera to capture a timelapse, as recommended further down below. You do not want to be messing with your cameras at the time of totality, since it will only last a couple of minutes. Build a small pinhole camera / projector: Building a small pinhole camera/projector is very simple. Just grab two pieces of cards, make a small hole in one card, then hold the card with the hole above the other one and align them with the sun. The sun’s image will be projected through the hole into the second card. If you want something more advanced, check this tutorial out, where it is shown how to build a simple projector using a pair of binoculars and two pieces of paper to safely observe a solar eclipse. Use the camera’s liveview / LCD: If you are planning to take pictures, you can also safely look at the LCD when your camera is in liveview mode. However, in order to protect your camera from potential damage, you will first need to make sure to mount a very dense / strong neutral density filter (15+ stop solar eclipse ND filter like the Hitech ND 5.4 is ideal) in front of your lens. After that, make sure to turn off Auto ISO, set your camera ISO to the lowest number (something like ISO 100) and stop down your lens to something like f/8. This will ensure that very little light actually passes through your lens to potentially cause any damage to your camera sensor. If you have a point-and-shoot camera with a relatively small front lens element, the same eclipse glasses you wear to protect your vision could be used to view the solar eclipse. Just hold it directly in front of the lens and it should do the trick. One thing you will need to decide early on, is whether you are going to be photographing the entire sequence of the solar eclipse, or just the period of totality when the moon blocks the sun. 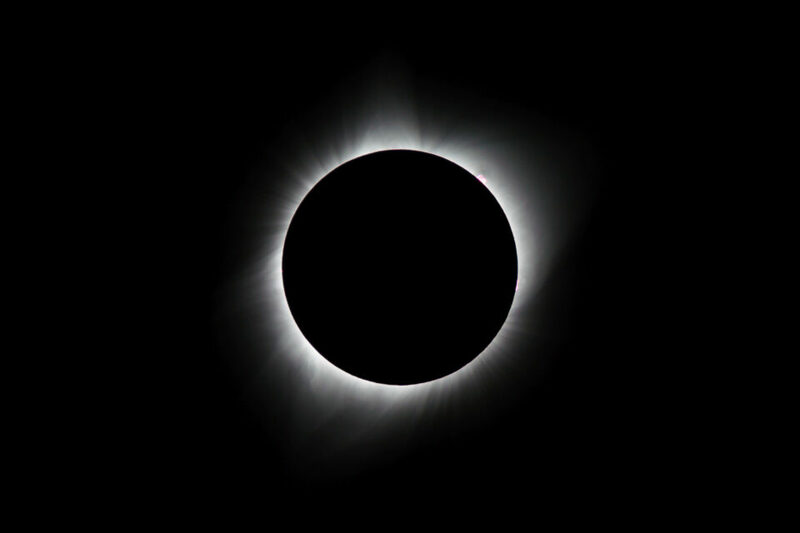 I would personally recommend to document the whole sequence from the beginning to the end, so that you have pictures of all the phases – from partial eclipse to “diamond ring” to totality and back. The great thing about having the entire sequence in pictures, is that you can later combine images together, creating a nice-looking composite image. Bear in mind, you will have to be very patient though, as the process could take a while. If for whatever reason you cannot stay for the entire duration of the eclipse, then I would just focus on times near, during and right after totality. Set your ISO to the lowest value like ISO 100. Set your camera mode to Manual. Set your shutter speed to its fastest value like 1/4000 or 1/8000. You will need to adjust it from there, depending on how dense your ND filter is and how dark it gets. Stop your lens aperture down to its “sweet spot”, which is generally between f/5.6 and f/8. Depending on what solar ND filter you are using, your shutter speed should be fast enough to not cause any vibration issues during partial eclipse. However, once totality starts, you will experience drastic drops in shutter speed, to the point where it will be necessary to remove the solar ND filter. To reduce chances of camera shake, make sure to enable Electronic Front-Curtain Shutter, if you have it on your camera. Once it gets dark, you will need to be much more careful when handling your camera gear. Make sure to either use a remote shutter release cable or exposure delay mode in combination with a timer to reduce potential for camera shake. Keep in mind that if you do decide to remove the solar ND filter during totality, you should still not use the optical viewfinder to look at the sun, since UV rays will be very harmful to your eyes. As soon as the totality ends, make sure to put the ND filter back right away! As you can see, your shutter speed will vary greatly depending on what phase of the solar eclipse you are capturing. When starting out with photographing a partial eclipse, even with a 5.0 Solar ND (16.5 Stops) filter attached, you might still be shooting at fairly fast shutter speeds. However, once total eclipse starts, you will need to remove the solar ND filter, or your shutter speed will be way too low. The last thing you want is deal with a long exposure – that will not only blur the moon and the sun, but also cut precious time. As you can see, we had to use a very slow shutter speed of 1/3 of a second at ISO 100 in order to bring out all that detail! No matter what lens you are using, getting accurate focus on the sun and the moon is extremely important. I know that some photographers suggest to shoot at infinity using lens marks, but since many lenses allow focusing “beyond infinity”, getting a true infinity focus is not that easy – a slight inaccuracy in focus will make the sun and moon appear blurry. Forget about trying to acquire focus on the sun without a solar ND filter – it is too bright and could be too small in the frame for that. What I would recommend instead, is to use the moon for focusing via liveview way before the solar eclipse starts. This way, you get your focus right with your setup once and you don’t have to touch it again until the end. Make sure to switch off autofocus once you get accurate focus, so that your camera does not attempt to refocus each time you take a picture. Once done, take a picture and make sure that it looks sharp by zooming in on it via the camera’s LCD. However, if you are planning to shoot with a wide-angle lens, then you will obviously need to carefully plan your shots and pay attention to both composition and framing. Having an interesting foreground subject is obviously important, so do take the time to scout a few locations early on. Ideally, estimate beforehand where the moon and the sun will be in your frame at the time of totality, so that you can place the two in an interesting location relative to your subject. 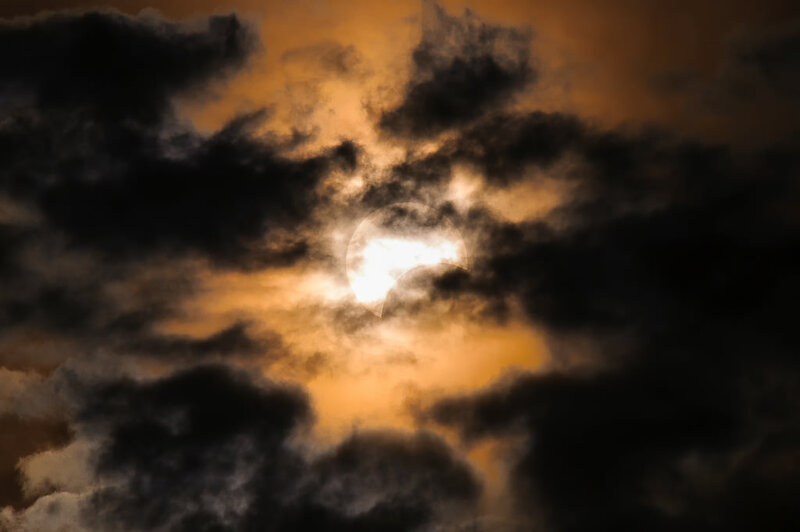 Keep in mind that things will get pretty dark at the time of totality, so if you are planning to shoot a timelapse, you should ensure that your camera will adjust its exposure accordingly. I used an app called “Photopills” in order to properly plan the exact position of the eclipse – it had to take place right above the peak of the foreground structure. Within Photopills, I fired up “Augmented Reality”, aligned the position of the sun for accuracy, moved my tripod to the exact spot, then started a timelapse before the eclipse. As you can see, it worked out perfectly! Don’t forget to enjoy the moment. While as a photographer you will most likely want to capture a solar eclipse, if all you do during the eclipse is mess with your camera and never even see the magic in the sky and all around you, then perhaps it is a good time to stop! Remember, this might be your only chance to see a total solar eclipse in your lifetime, so make it an unforgettable experience, not a picture-taking-only experience. Are you planning to see or photograph the total solar eclipse next month? If yes, then please let us know where you are planning to be, with whom and what you are planning to take with you gear-wise in the comments section below! Very nice tutorial. Some of these techniques can also be used for the upcoming transit of Venus across the face of the sun on June 5. This was my first attempt to photograph a solar eclipse. I did a lot of research on the best techniques. Then I purchased my eclipse viewing glasses as well as an aluminized mylar filter. I already had a neutral density ND3 (10 stops) that fit my smaller lenses. With this gear and information I then began to practice shooting sequences and testing equipment. That practice paid off during the event. I shot a sequence of images at 3-minute intervals using the 50mm lens with the ND3 filter. As the eclipse ended and the sun set I took a final set of images without the filter. These were then composited to produce a single image showing the progression of the eclipse. I used the mylar filter on a second camera (600mm focal length). I don’t think this darkened the solar disk as much as the ND3 but it still produced excellent results. David, looks like you had much better luck than me in terms of weather. And you picked a great spot to watch it too – Grand Canyon :) Your composite image is stunning, wow, what a beauty! Thanks so much for sharing. I envy David the 600mm — thought of renting one from LensRentals, but couldn’t hack the $380 or so. So I drove 200 miles south to Parowan, Utah with my 200-400 + 2x TC and got very nice pictures with the D7000. I planned in advance, and prepared safe solar filters. The relatively cheap and very safe way to do that is to get some Baader ND5 solar filter. I got mine from Agena , but there are many sources. Sandwiched pieces of it in foamboard, with cutouts for my 200-400, 70-200, and binoculars. It worked great. Ended up shooting everything at ISO 400, f/8, 1/1000, which put the sun right against the right side of my histogram. Loaned the 70-200 + 1.7x TC to my 10-year old grandson to use on his D50, and he got something to be proud of as well. The whole family used the binoculars and our old 8″ Dobsonian telescope, and found it an awesome experience all around. We were 30 miles north of the center, so we didn’t get it quite exactly centered, but close enough. My real goal is the Venus transit, and if you want to photograph that you absolutely need the proper solar filter to get the definition on the sun’s surface that you need. It won’t happen again for another 129 years or so, so worth doing. The 600-mm was just the zoomed-in end of the Panasonic Lumix FZ-150 — which is a 24x super-zoom from 25mm to 600mm. I was surprised that it worked this well! I’ll probably use the FZ150 and solar filter combination for the Venus transit. Hope the weather is as good for that as it was for the eclipse. Hello David, I also have a Fz150. and look for the P-6xxx filters. I ordered a larger filter for another lens but it fit this camera as well. Note, however, that they can not guarantee delivery in time for the transit. Alternatively, you can order a ND3 neutral density filter with a 52-mm thread from any of the photo sites (e.g., B & H Photo). It costs more but is very high quality and it can be used for other types of photography. I have this filter: B+W 52mm 3.0 ND MRC 110M and used it on my Nikon 50-mm lens for the composite image. I want to mention that for non-total eclipses, it’s really useful to figure out your desired exposure a few days ahead of time, because even with the sun 95% blocked you want to properly expose the portion that is visible. Note, for total eclipses (like the one in Aug. 2017), during totality, you’ll need to remove your filters and and select new exposure settings in order to photograph the corona. I found (courtesy of the Baader ND5 material I ordered weeks before the eclipse not having shipped) that two layers of aluminized mylar gives you ND 4 or so (about 13 stops). Also, telescopes with 1200mm focal lengths are available with stellar optics for a fraction of the price of a 600mm lens + TC, since an aperture fixed at f/8 or f/10 isn’t really a problem when photographing the sun (and you can use a mask if you want in addition to using a solar filter), and also comes in handy when photographing the moon. Hi Nassim! I’ve been a huge follower of your website from Singapore! And I have learnt a lot from the articles and reviews! By the way, would you be attempting to capture images of the “Transit of Venus”, which is coming up on the 5th/6th of June this year? It would be great if you could write an article about tips for us photographers to read up on, prior to the actual event. This would be the first time I’ve heard of the Transit, and will also be the first time I will be trying to capture it on camera. Hope to hear from you! 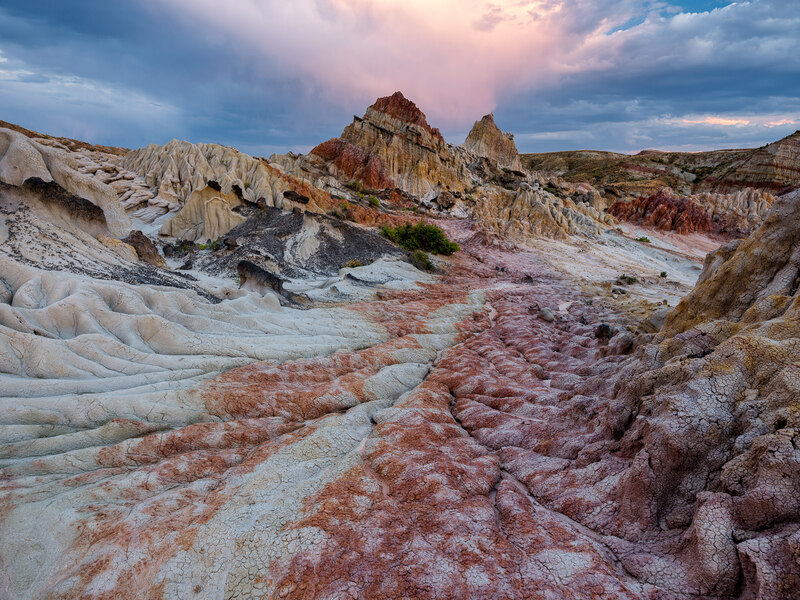 Is it possible to use polarizing filter? Not unless you want to fry your sensor and blind yourself. But how to shoot without ND filter? I recommend you get a proper solar filter from a reputable dealer/manufacturer. We’re talking about the future use of your eyes. Accept no substitutes. Is there any advantage to using a 2X, 3X or 5X Barlow adapter when photographing a solar eclipse ( August 2017) with an adapted CCD webcam? PS: I also have a SX540 Powershot but I think I will need to put an adapter on that lens. In the first sentence you state to use f/8-f11 for best results. Then in the next sentence, you say don’t apertures larger than f16. Can we assume you meant don’t use apertures SMALLER than f/16, because f/8 and f/11 are both larger apertures than f/16. For the 8/21/17 eclipse, the sun will be high in the sky at my location. 1) If I have the proper filter on the lens of a DSLR, wouldn’t it be safe to use the viewfinder? My camera doesn’t have a tilt screen to be able to use live view at the angle the sun will be at. 2) My tripod only allows a tilt of about 45 degrees off the horizon. The sun will be higher than that. I can adjust two of the legs to be lower and wider to increase the angle. Yesterday when I attempted this, the angle was still not steep enough and the tripod became unstable. It was also impossible to physically get low enough to see the live view and frame. I didn’t even take a test shot. I’m thinking the only way I might be able to do it is handheld. I have a Murami solar filter and an white light filer on order. Plan to test both soon to plan the shot. Any other ideas on how I can accomplish this? I would never use the viewfinder when photographing the sun… I was tracking a hawk once and didn’t notice he was crossing the sun. It’s not a pleasant experience… Use live-view and save your sight. Does your tripod have a ball-head or something else? If it’s a ball, does it support going vertical? If you do that you should be able to achieve the angle needed. It is a 3 axis head not a ball. I have been practicing set up and found the only way to achieve the angle is to put the lock plate on backwards. Makes it a little awkward having the handles in front, but it is workable. A problem I discovered doing this is that the angle will be almost vertical. When the back of the camera is pointing at the ground, the light from the ground reflects off the LCD and makes it impossible to see anything on it. For about $7 I went to a craft store and bought some flat back foam board and had black duct tape already. I made a box to fit over the camera with a flap to help shade the back. When the sun is slightly lower in the sky that works, but at near vertical it isn’t enough. I have enough board left over to be able to put it on the ground but the reflection is too big. Found that the best way to do it is to cut a piece to hand hold where I want it. Tried both the Murami and Thousand Oaks. Just sold the Murami. I like the results of Thousand Oaks better and it was less than half the cost. Thanks so much. Great tips. I will be practicing this summer for the August 21st eclipse. I’m also in Denver and will be camping in Casper WY. to see the total eclipse. I’ve just discovered your site and look forward to exploring it more. Great tips. I’m going to buy my filters now before the rush. I’m excited, I’ll have full eclipse about 40 miles south of my house. During totality, what kind of exposure time would you recommend to capture the surrounding landscape as well? Jon, if you are planning to do a wide-angle shot, you should probably meter off the whole scene rather than the sun. I would definitely recommend to bracket your shots just in case. Please see the table provided in the above article for details on what to expect in terms of exposure time between different cycles of the solar eclipse. I went to a local camera photo shop today to buy a ND filter but he told me it would not work and recommend a solar filter which had a solid mirror finish on it. Who is right you are the sales person at the camera store? Isn’t time to upgrade (if needed) and put this thread on top for upcoming Solar Eclipse on Aug 21, 2017? Venu, already done! Please see the updated article from today. Nasim, doesn’t A mode help dealing with changing shutter speed? For timelapse, I always use A mode if the scene is changing. If you are planning to do a timelapse with a wide angle lens, I would definitely shoot in aperture priority mode. in addition to mu comment, it is thousand oaks optical, they sell film sheets of what they call solarlite large enough to cover the front element for 42 dollars, still available a while ago, as I ckecked it out. I don’t know about filters for using “inside” the lens, and although I don’t have a technical background in order to get advice pr not, my personal preference is to put a filter in “front” of the lens. framing the sun is not easy task with such a focal length, my method is before using the viewfinder pointing the sun until the shadows on the side of the lens are equal on all sides, of course I still need the sun, and in an eclipse situation is different. Will be in Oregon in the path of totality for the August 2017 event. Interested in getting a time lapse wide angle series of the eclipse event showing the landscape and the sky. Hoping to create a “movie” that shows the ambience of a total eclipse from start to finish rather than shots of the face of the sun itself during the eclipse. Thinking of trying to compress around 30 minutes of action (15 min before and after totality) into a short movie. Using Canon 5D4 on tripod with perhaps a Sigma 20mm 1.4 or Rokinon 14mm 2.8. Won’t need solar filters since I don’t really want to show the face of the sun per se, just the progressive darkening, totality, and progressive lightening. Sun will be in the frame, however. Never done this sort of thing before. Any suggestions on how to time the shots and control the exposure as the event unfolds? Thanks. Will there be anything to see photograph if you are not in the path depicted on the plan?? Best article yet that I’ve read on photographing the eclipse. I’ll be doing it in Oregon with what I’m hearing will be a million other people! For the wide angle shot with a time lapse on the second camera (and tripod) would you recommend setting the exposure to “A”? Also did you take a second camera before and if so, what focal length lens did you use (or recommend). We won’t get a second chance. I’ll be focusing well ahead and using gaffer tape to lock my focus. Thanks! Jerry Hammond, so. California. With our modern sensors, in 2017, I don’t understand the need to shoot at ISO 100. I’m a Canon shooter, so maybe Nikon has some problem that I’m not familiar with, but I’m thinking ISO 200 or 400 and f/8. That would give me hand holdable shutter speeds, with a 1000mm rig, with image stabilization. At corona, I might bump ISO up to ISO 1600 to get enough signal to the sensor. Am I missing something? Is the corona really so faint that we might need a 4-sec. exposure at f/4 and ISO 100? 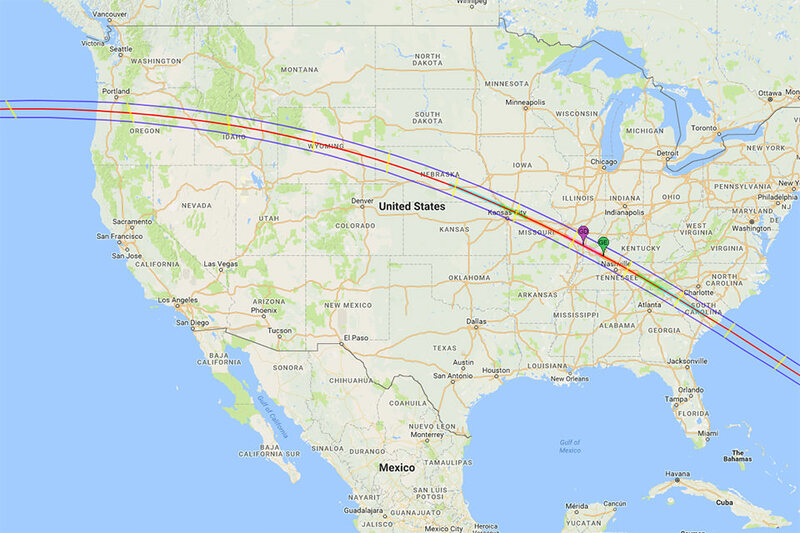 I live in Ohio but will be traveling to the home of my kin-folk near Maryville, TN for the August 21 eclipse. I will be using a Nikon D750 SLR, 28-300mm zoom (at 300mm), Siri tripod with ball head and, of course, a Thousand Oaks solar filter. I also have a B+W ND 1.8 (64x) for use if needed between totality (no filter) and full sun (solar filter). I will spend some time practicing the setup and filter changing. I intend to shoot mirror-up with a remote shutter release. Thanks for the tip on focusing at infinity. I will do that a few days before we leave Ohio and fix the focus ring with duct tape or similar. I also purchased a couple dozen eclipse eye glasses to use and pass out to others who may not be prepared. Great article. I’ll be in the central Indiana area and only a partial eclipse (90.7%. I’ll be with my family. Should I use the ND filter throughout? I’ll be using a 300mm zoom lens with a 2x tele-converter. Hello, I’d like to photograph the upcoming Aug 21, 2017 solar eclipse in South Carolina. I have a Yashica film camera with a 500mm mirror lens. I’m getting mixed signals on whether or not it’s safe to look through the camera’s viewfinder even if I have a solar filter on the lens and am wearing those special solar glasses. Would a better option be to use the camera viewfinder to project the sun onto a piece of paper, again with the filter on the lens to avoid damaging anything, in order to set up the thing to get the best shot. Any advice would be greatly appreciated. Could you elaborate on when Bailey’s Beads, Chromosphere, Prominensces, and Corona will happen in relation to totality? 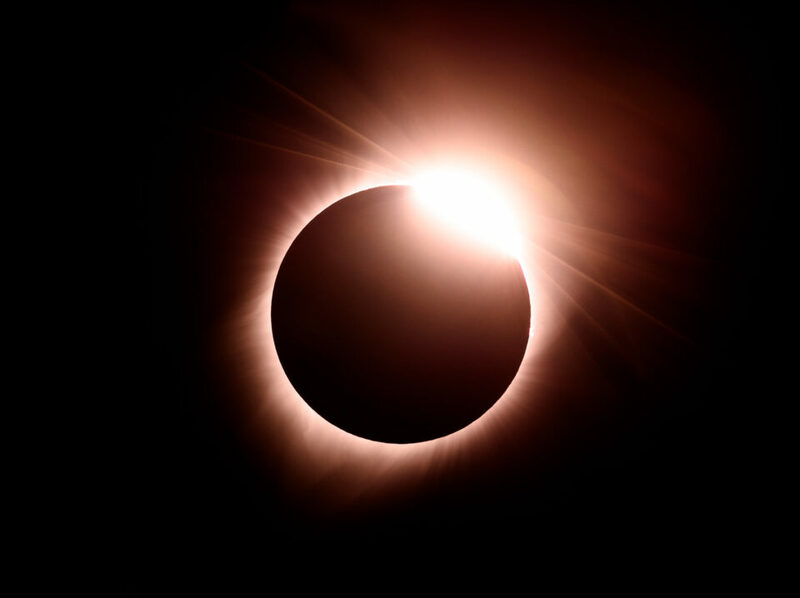 The Astronomy magazine mentions the diamond ring is 15 sec and the Bailey’s beads are 5 sec before “second contact”, that is, start of actual totality. The rest of the features have to happen after the “second contact” but not sure for exactly how long. I would question the sharpness when adding TCs, even to a top tier prime (I don’t use TCs with a zoom – ever). It’s my experience with far shorter distances that the larger the distance, the softer the shot relative to the strength of the TC. In real practice, I rarely use my 2x TC, except at relatively short distances, the 1.7x is fine for more distance and the 1.4x is decent at longer distances. This includes dialing in each lens/TC/camera via AF Fine Tune (Nikon shooter) – and after a lot of shooting, I also rarely use TCs with a cropped sensor or smaller (Nikon 1, for example), as the noise/softness isn’t worth the extra magnification. I get better results with less magnification and cropping (and I don’t like major cropping to compose a shot – better to use foot zoom, when possible.) For this event, I’m leaning toward using D500 on 600 f/4, as this combo works pretty well, though I often prefer to shoot the 600 with the 1.4x or 1.7x on the D5 instead, but not at longer distances. Too much glass. All this commentary to suggest I’d really question the benefit of shooting with TCs for this event if one is trying to get tighter compositions, given the distance we are dealing with. Just an opinion – others may see/experience differently. Additionally, in my experience, especially at longer distances, I fine the Nikon 1 v2, very noisy at longer distances, too. Have tried it on the end of the 600 and got more useable results with cameras with larger sensors. Again – just my experience. Nasim…this is decidedly not a “once-in-a-lifetime opportunity”. This will be my fifth. And there have been many others in my lifetime. I have a 3×5 piece of welding glass, shade 14. I was planning to make a foam core holder to fit over my 18-250mm Tamron zoom on my Nikon 7100. Does anyone know whether this will work? And does anyone know what the ND equivalent of Shade 14 welding glass would be? In your table it appears you have used shutter speeds vs f-stop numbers that are actually for ISO 25. For examples; In your table, it shows that for ISO 100 at f8 (with ND5 filter) the shutter speed for the Partial phase would be 1/125. But if you look at the source table, and follow the ISO 100 row over to f8, then drop down to the Partial 5.0ND line you will see that the correct shutter speed per the source table would be 1/500. Another example, for “Baily’s Beads” your table shows that for ISO 100, f8, the shutter speed would be 1/1000. If you look at the source table, and again start at ISO 100, then move to the right to f8 and then drop down to the table below to the Baily’s Beads line, it appears the correct shutter speed would be 1/4000. That is 4 x faster than what your table suggests. I’d be concerned that if someone used a shutter speed 4 x longer that they should (especially with no filter as your table suggests) they would risk damage to their camera sensor. I didn’t check all the numbers but it appears your table, which is supposed to be for ISO 100, is using numbers from the source table that are for ISO 25. I just discovered this and wondered if I had made an error. I’ve made a spreadsheet using the formula in the “guide” and it agrees with your numbers. Interesting that this has been out for over five years and you were the first to check it. Thank you for pointing the error out! I went ahead and updated the article to reflect the correct numbers per the original table. You are right, the numbers were off, based on ISO 25 instead of ISO 100. I made some comments when this post first appeared (Comments 1, 2.1, and 2.1.1.1) In those comments, I indicated that I successfully used a 10-stop, ND3 filter to photograph the solar eclipse (and, later, the Venus transit). That filter has a 52-mm thread so it doesn’t fit my current set of lenses. I ordered a new 10-stop ND3 and after testing realized it wasn’t as dark as my original ND3. I returned it for another brand. Same problem. I then did some testing using my Kendrick Astro filter (rated as ND3.8) and discovered that my original filter is MUCH darker than 10-stop ND3…and darker than the ND3.8 filter. Thus, I suggest that folks reading my original comments not consider a 10-stop ND3 filter to be sufficient. It probably is not. It would appear that the original filter I purchased was labeled incorrectly…or something. An ND 4 filter is cutting 2 stops. An ND filter cutting 10 stops would ND 1024. E.g. a filter having a transmittance of 1/1000 would be designate ND 3.0, very nearly 10 f-stops. Lee and Tiffen would use code 3.0 ND; other manufacturer use codes ND1000, ND1024, ND1000x, or just 1000x. Nasim’s article recommends 5.0 ND for a partial eclipse, which is ND100,000x, 16.6 stops. I bang my head and throw my arms up in dismay. Why do so many people feel they need to go to the trouble, expense and health risk to photograph this solar eclipse? It’s a completely familiar image, seen many times in the past. It always looks the same except for minor post-processing differences. Only those with the best technical equipment will get a decent image. Looking at the sun’s corona WILL damage your eyes. There will be almost countless, well-made images to view after the event. Again, they will look practically the same! Cheers, and don’t take this personally, I’m just wondering what all the fuss is about! Have you ever gone to a movie? And paid to see a show you probably can see on TV in some months? Or gone to a sporting event you could see live on the tele? Or pehaps bought a new sophisticated mobile phone, when you could still talk to friends and family with a mobile phone from 15 years ago? Don’t disdain of others’ wish to see a unique marvel of nature. I waited until the last minute when the itch to shoot this phenomenon became too strong. Lucky for me, and truly it was luck, I was able to get the filter I need. But even though I’ve known about this for at least a year, and am regularly reminded via email, initially I was going to pass up the opportunity for the very reason HomoSapiens… expressed. But this is a recurring issue I grapple with, the need to experience and the need to document an experience that’s well-documented already. But I must admit, I love the analogies presented by Siggi… This is the best explanation I’ve heard that answers this specific question and dilemma. Thanks, Siggi! Any one ever put zoom lens on a Canon Powershot ? I’ll will be in my driveway at home in Grand Island, Nebraska. I’m using a Nikon D7200 with a AF-S Nikkor 70-300 MM 4.5-5.6 long lens. This will be parked on a Bogen Pod using a remote shutter release, mirror up mode. I have been planning and organizing a visit to the US for almost a year (since September 2016…) – the main excuse for travelling is the eclipse, but just like many americans do when visiting Europe (visit London, Paris, Rome, Barcelona, the Alps, the french riviera and the Aegean Islands… Am I wrong? Naa…), we will be visiting New York, Philadelphia, Washington, Fallingwater, Niagara Falls, Shenandoah, the Eclipse and last, Chicago… Quite a journey in 15 days. Portuguese paychecks aren’t comparable to americans’ so we have had to plan everything well ahead – NYC hostel, citypass, tickets, car-rental, etc. and pay ahead, also, to alleviate the budget in the final run. I plan to be somewhere south of Marion, on the morning of August the 21st with my gear, wife, daughter and two pal’s. Gear-wise I’ll bring the usual. D300, D700, 14-24, 24-70, 70-200 and 1.4 TC, two solar-hood filters, a GoPro session4 (for time-lapse) and the mobile phone to film the eclipse. I bought Alan Dyer’s online book ‘How to photograph the Solar Eclipse’ some months ago (10$ well spent) and it has been very good for preparing. A funny expression is used in the book – umbral virgin – about those who have not yet experienced a total eclipse. I travelled 1200km to photograph the anuar eclipse in NE Portugal more than a decade ago, I am still an umbral virgin, and we will be travelling across the Atlantic and about 5000 kilometers road-trip to loose our virginities!! Thank you all and hope to see (some of) you in the path of totality on Aug. 21st. Thank you Nasim, for this good forum and great source of knowledge and everybody for sharing it. 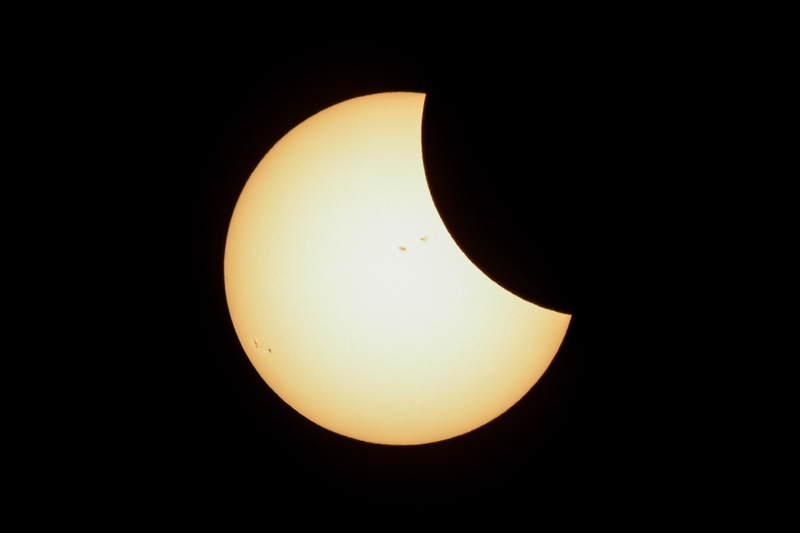 When you photographed the partial solar eclipse shown in picture above, did you use ND filter or not? If so, did you use 18 stop or 16 stop filter for the partial eclipse? Venu, I stacked an ND filter with a polarizing filter, since a single 10 stop ND filter was not enough. I recommend that you get a specific 15+ stop ND filter for this event. Wondering if I can get suggestions from the readers about shooting a Partial Eclipse with a foreground object. If including a foreground object like a tree or rock, how does that work? If a 16 stop filter is used, it will be dark (with no foreground) except the eclipsed sun. If no filter is used during partial eclipse, foreground will be ok but the sun will be too bright. How do you reconcile to include Partially eclipsed sun along with any foreground object? If 13 stop or 10 stop filter is used, will it work? You will need two images with two very different exposures. The exposure for the partial eclipse will be so dark that nothing but the sun will be visible. You will need to take a second shot with the correct exposure for the foreground — either before or after the eclipse and when the sun is not in the image. Several years ago I photographed an annular eclipse over Grand Canyon in Arizona. After the sun set I shot another image of the canyon. I then blended the two together. you can paint with light on long e xposures. There are some filters that show sun in yellow and others in white. I am trying to find the filter that would show the sun with orange/yellow color in the photo. I guess you can get that done probably in post processing, but do you recall which filter you used and did it show yellow or white? Does anyone know which filter would produce that sun in orange/yellow? Venu, I would recommend to do it in post, rather than dealing with multiple filters in the field. Bharat, at 400mm equivalent you should still be OK for some details, but you will need to make sure that you capture in as much detail as possible, so that you can crop further. I would not recommend a 2x teleconverter unless your lens is ultra sharp. Sony A6000 with 55 – 210 lens and with solar filter to photograph the pre and post Totality. I know I need to figure out the ISO w filter and shutter speeds. Tripod too. I don’t have a tracking tripod. Nikon P900 for the Totality. No filter needed. Tripod and wireless shutter. Exposure bracketing. Given that I’m such a newbie I’m going to focus on the Totality. Fran, that sounds like a plan! You won’t need any filters for totality and the P900 will capture lots of detail. I will be viewing the eclipse from a houseboat on Lake Kinkaid in Murphysboro, IL with family and friends. I will be photographing with a Canon DSLR and tripod. Hoping for the best. A strong word of caution. Your article states that “A dense ND or a solar filter is a requirement to prevent potential damage to your eyes or your camera gear.” In four other places you talk about using an ND filter. A neutral density filter is not enough protection for your eyes. You need a solar filter. ND filters generally block visible light, but do not sufficiently block infrared or ultraviolet radiation. The visible light contains less than half the energy of the sun, the rest is in UV and IR, which will cause eye damage and very possibly camera damage. Thank you Mark for the note! I agree, a ND solar filter is the way to go, since it will block both light and UV at the same time. I will make sure to point this out in the article. I have photographed the sun before using the LCD with a 10 stop + 2 stop ND filter stacked on a Sony A99ii Camera with a 500mm mirror lens in APS-C mode( 750mm) This produced good results. I only had the lens uncovered and shutter opened long enough for focus confirmation and the shot. No issues with the camera, however I would never leave the lens uncovered for video or a time lapse with just ND filters. I use solar filters now and it lets you Capture video and time lapses safely. I have a Shade 14 welders glass I plan on using for photographing the total solar eclipse on August 21. I will cover my lens with this piece of glass with rubber bands wrapped around the edges (cardboard covered) and the camera body. Will this method work? Will this damage my sensor? Is it safe to look into the viewfinder with my bare eyes? I also have another welders goggles fitted with Shade 14 glass I will use to watch the eclipse. Any suggestions or comments appreciated. It won’t damage your sensor but use your LCD and not the viewfinder. Welders glass does not filter UV or infrared. Nasim,as always I enjoy and learn from your articles. I have seen nothing, in reviewing many solar eclipse articles, that addresses the timing between shots for the partial eclipse and totality. For example, for the partial eclipse are photographs recommended for every 3 or 5 or 10 minutes? In totality, 2minutes and 30 seconds where I will be located, I plan to shoot almost continuously, every 5-6 seconds between exposures. I will be bracketing, probably 5-7 exposures per shot to capture as much of the aura as possible. Also,is it safe for the sensor to shot the entire time in the “mirror up” position or will this over time burn out the sensor? Will be using a Nikon D800,80-400mm,Solar 5 filter,TE 1.7 and remote release. Thank you for you articles and time. I’m a complete newbie when it comes to photography, I will be near Eugene Oregon during the solar eclipse. I have a Nikon D3200 with 200mm lens would a Hoya Solas IRND (6 Stops) with a uv filter and or a CPL filter be adequate to protect my camera? And not to be redundant but just so I’m clear, during totality I do not need filters? Great article, Nasim! Even though I love what you have to say about being in the moment of the eclipse, something about capturing that moment in pictures is equally as enticing to me. So your tips on equipment, camera settings, technique, etc. are really helpful. I’m going to do a couple dry runs this weekend and find a good spot to be for this once-in-a-lifetime event. Need your expert view on shooting solar eclipse. I have Nikon D500 with 300mm f/4e, 2x tc and have 100mm square 10 stop and 6 stop filters with adapter for this lens. Will it work stacking 10 stop and 6 stop. Secondly, I have Nikon 1 V3 with FT-1, 300mm f/4e with 1.4tc and use 10 stop and 6 stop nd filters stacked. What do you think about this setup. Will be heading to Kentucky tomorrow night from Ohio to give eclipse photography my best shot (pun intended). Will be shooting with my Canon T5i body and Canon 400mm f5.6 L lens with 2.0x teleconverter (f11 w/ converter). Should be good for around 1300mm on my APS-C T5i. Am hoping for at least one shot I can print and hang. But either way, it should be an awesome experience for myself and 2 daughters. and you mean Remote Shutter Release, not REMOVE shutter release. Thanks to all of the contributors and the author of this thread. I have learned enough that I now realize my chances of a decent photo Monday are slim-to-none. I’ll be using a Nikon D5500 with 18-200mm zoom and a #12 welder’s glass or my Nikkor 300mm zoom or maybe use both cameras hoping for one or two keepers. The #12 shade was as dark as I could find locally on short notice. I had only about 26 years to plan for this event. Our patio in Oklahoma City will get 84 percent, so I have to try even thought my expectations of success are dwindling. I am surprised that no one mentioned using the Nikon WMU WiFi capability (or later Blue Tooth versions) to operate the camera remotely – especially those folks without a swivel LCD touch screen on their cameras. The glare issue for me would seem managable by stepping off the patio into my house to view a larger image on my iPad. If focus needs tweaking, I could step outside and make adjustments, and as several contributors herein mentioned, I will tape the focus ring in place if I get a good focus on the moon. The image on the iPad is much larger than the camera’s LCD screen, and I can release the shutter via the iPad – thus eliminating any chance of camera shake. I presume that I can expand the image full screen or fairly large on the iPad, which seemingly would make it easier to know if I am focused with the 300 mm zoom and the better quality 200mm zoom lenses. Perhaps there is a downside to using my iPad to take the shots with the D5500. I installed the WMU app only yesterday, and it seems to work very well. However, maybe file size is limited when using the WMU WiFi app to operate the camera? My plan was to shoot RAW files and post process crop if the image is reasonably crisp and noise-free. I realize the D5500 is not a professional-grade camera, and the D200 is a museum candidate, but I wonder what is wrong with using the WMU app? The poor chap who mentioned that the sun will be almost straight up – and his camera’s LCD is not a swivel – would benefit from the iPad or Android WMU app to better see what his camera sees. The sun will be very high here in Oklahoma City as well, which motivated me to install the iPad app. Any comments would surely be welcome as I am down to one day of a practice shots remaining. Please do not worry about hurting my feelings if the iPad WMU with the D5500 concept has a fatal flaw. It sounds like the shade #12 glass must be perfectly parallel with the camera lens, and perhaps I need to seal the edges somehow to avoid glare, shadows, artifacts, and a host of other issues. Thanks for the great article! I have a Formatt Hi-Tech 16-stop screw-on filter, a B&W polarizer, and a B&W UV filter. Would these be sufficient to protect my sensor all stacked together with a 70-200 + 1.4x TC? Thanks for all the help Nasim! I was able to pull off some fun shots as a result of the walk through. Much appreciated. Hope you had a chance to enjoy the eclipse as well. Nice update to this article, Nasim. I hope to be using it as a basis for one of the upcoming eclipses! Thank you for your feedback Greg! I think you meant “Remote Shutter Release”, not “Remove Shutter Release”. congratulations on this excellent article. May I ask if you did use the Nikon 300 f/4E PF VR during totality (no filter)? Did you notice any issue due the phase fresnel lens element?